HANOI/KUALA LUMPUR – The Irish Government is again promoting Ireland as an education destination for Asian university students, with Minister of State for Trade and Development Joe Costello in Vietnam’s capital Hanoi on Monday for meetings with Vietnamese officials. “I want to encourage connections between Vietnam and Ireland and want to see more Vietnamese students come to study in Ireland,” Min. Costello said. 24 Vietnamese are currently enrolled in Ireland’s universities funded by Irish Government scholarships, with an alumni network of Vietnamese who studied in Irish universities now numbering over 100. In November 2011, Mr Costello’s predecessor as minister Jan O’Sullivan – now Minister of State Department of Environment, Community and Local Government – visited Vietnam, signing a Euro55million Irish aid package effective over a five period. Speaking at the time, Min. O’Sullivan said that Ireland hopes to attract some of the 1,500 Vietnamese who receive annual overseas study scholarships from the Vietnamese Government. Tapping the Asian student market has created a multi-billion dollar industry within Australia’s third-level education system, with around 23,000 Vietnamese were part of a total of 240,000 Asian students enrolled in Australia, according to Australian government statistics. In New Zealand, a similar-sixed country to Ireland, the number of Vietnamese students in New Zealand has risen from 184 in 2000 to 1,517 in 2009, and Vietnam is ranked 13th among source countries of fee-paying international students in New Zealand, according to Education New Zealand, that country’s body responsible for promoting the country overseas as a study destination. Speaking last Friday at the Asia-Pacific Ireland Business Forum in Kuala Lumpur, Ireland’s Ambassador to Korea Eamon McKee said that drawing an Asian student to Ireland can be worth 4 to 5 times in cash terms to the Irish economy, compared with a European student. 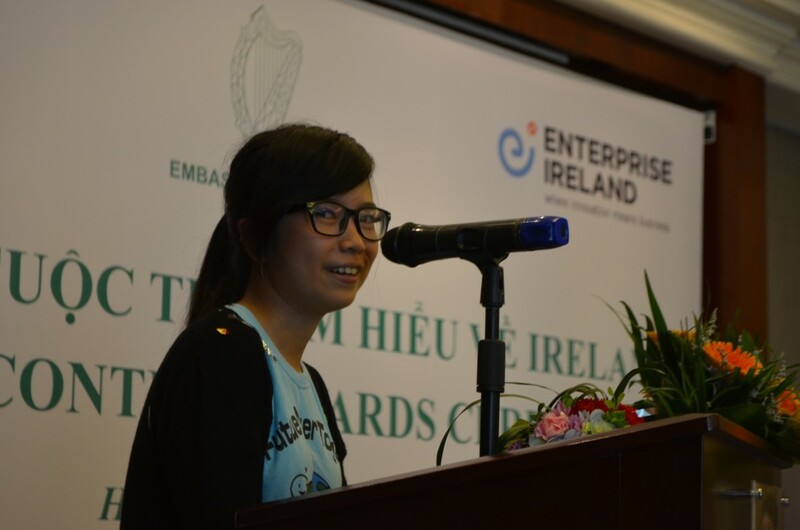 Soon to come to Ireland on a 2 week English language course is Nguyen Thi Thuy Dung, 21, Monday’s winner of an Irish Embassy/Enterprise Ireland essay competition for ideas how to promote Ireland in Vietnam. Awareness of Ireland as a possible destination for university study has improved overall it seems, as more Vietnamese who studied in Ireland return home to work. “One of my friends has chosen to study in Ireland over Australia after discussing with me– he was offered scholarships for both,” said Ms Nguyen Hoang Giang, 27, who studied at UCD in 2010 and is now a lecturer at Hanoi Agricultural Institute. “The MBA programme I did is in the Top 100,” said Dinh Quynh Anh, who came back to Vietnam 2 months ago after a year in Dublin. She was referring to the Smurfitt Business School’s ranking of 86th in the 2012 Financial Times listing of MBAs worldwide. While boosting Irish university rankings might be a challenge, longer-term, some more immediate hurdles to raising Ireland’s education profile in Asia might not be so challenging. Speaking in Kuala Lumpur last Friday, Ireland’s Ambassador based in Singapore Joe Hayes pointed out that “there are no Asian faces on any of our educational PR literature,” an omission that Mr. Hayes believes should be remedied.